La Cologne Du Parfumeur: a citrus aromatic fragrance for women and men, introduced in 2010. The nose behind this fragrance is Thierry Wasser. "Originally, I created this Cologne for myself. I composed it at the same time as Idylle, it was my downtime. I wanted a Cologne in the tradition of the great classics but with a modern twist." "Created in 2010 by Thierry Wasser, Cologne du Parfumeur is a modern water cologne with green and musky facets, sweet and crunchy. Its bottle, studded with 69 bees symbols of the Empire, is characteristic of the family of "Waters" of Guerlain. It can be customized to order, hand decorated with fine gold and signed with initials. Intimate, fresh, contemporary. This mixed water opens the doors of a classical universe with notes of citrus and orange blossom. It is an orange flower extremely gentle with green and crisp facet. She then reveals musky notes make this more original and intimate cologne. 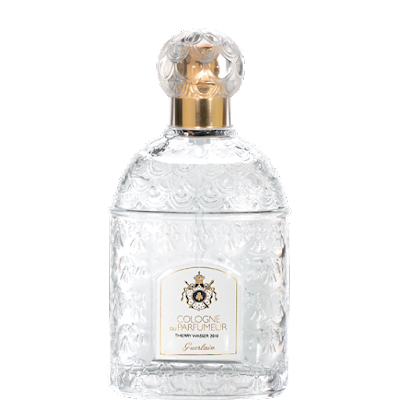 Unlike other creations Waters, Cologne du Parfumeur can not combine with the usual perfume, with the wake and the holding of fresh water." So what does it smell like? It is classified as a Citrus Aromatic fragrance for women and men. Presented in the white bee bottle in various sizes.